It’s full steam ahead on the train to the North Pole with this festive installation of the Sugar Train franchise. Satisfy your sweet tooth with chocolate, candy canes and free spin bonuses in this online slot casino 5 reel game. This title was developed and published by EyeCon, an Australian company that delivers great titles to the online slot games market since 1997. Sugar train is the major title that made the casino players fall in love with the company. Games just like that are what made them famous in the digital gaming sector, with over 100 titles in their portfolio, all of them being designed for entertainment, with stunning graphics and top-notch gameplay and animations. Getting you to enjoy every single spin is their focus, as this game-development company has invested a lot in highly-skilled professionals specialized in 2D and 3D graphics. This game delivers a high level of entertainment within a clear, concise and crisp design. You can discover more uk slot games here. 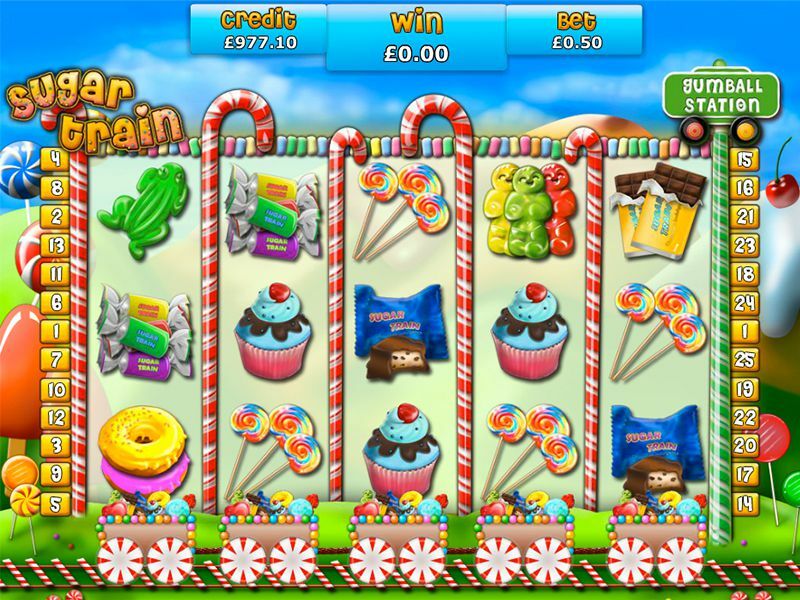 We all know Sugar Train slots game, don’t we? Well, what about a little twist to it? A little bit of snow, the same huge variety of sweets, add some more gifts, lollipops, a bit of Groenlanda (Greenland), some magic of Santa Claus and the spirit of Christmas, and what do we get? 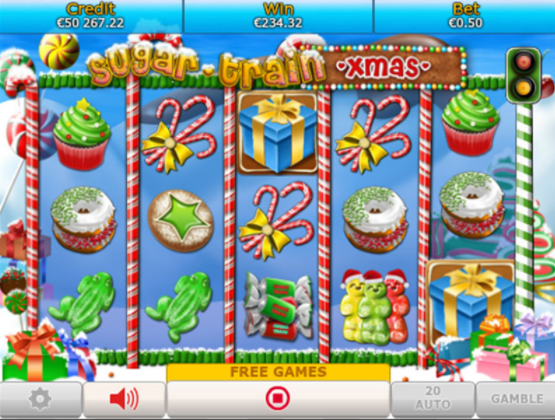 Yes, we get Sugar Train Xmas, one of the most famous free casino slot games with a taste of Xmas. With the same bonuses, free spins and more, are all still available in this 5-reels, 3 rows, 25 pay-lines slots game made for everyone to enjoy given its simplicity achieved by a great design with delicious graphic designs of Christmassy elements such as Sugar Train Chocolate, Frog Gummy, Gummy Bear, 3 Gummy Bears, 2 Chocolate Bars, Candies, Sweets, Mint, Rainbow, Cupcakes, and Doughnuts. With all this delicious bunch mentioned, I am already hearing Santa’s sleigh’s jingle bells and his reindeers speeding up to carry the white-bearded, red-suited old-man so he can go down my chimney to place a big sack of gifts right under my Christmas Tree. It is not going to be Santa, but Sugar Train Xmas that is going to give you a fantastic lot of gifts and prizes with its amazing variety of bonuses. Spin today and discover more popular slot games. Starting with a gambling option that gives power to our intuition, that can quadruple your win and continue with free spins, wilds and scatters, this game gives you limitless ways of winning and entertainment. The wild is represented by the gummy bear's symbol, get at least 3 of them on the screen and you’ll get them free spins, while if you are lucky enough to get at least 3 Rainbows on the screen, you’ll see how the scatter, that they represent can multiply your earnings. Get ready for an amazing experience, mixing and matching two of the little things that the kid inside of you is in love with, sweets and the giving and receiving the spirit of Christmas, only with Sugar Train Xmas from EyeCon. We were impressed by the seasonal twist added to the original Sugar Train, already a famous title, among the casino-lovers. The whole slot game delivers a great experience in terms of atmosphere and interactivity with the user. We definitely recommend it if you want to feel as a child again and hop in a trip of enjoyment with Sugar Train Xmas! click here to get started.